Our Trade-Up plan is simple in order to keep our young customers riding on a bicycle that is safe and always fits. Everyone deserves to enjoy life on two wheels. We believe that the bicycle symbolizes the simplicity and joy that is life. Safe and correctly sized bicycles result in a safe and happy bike riding experience. Everyone remembers their first bike, no matter what it was, and the memories always make you smile. 1. 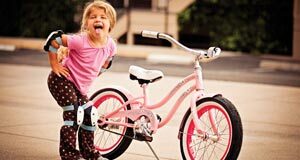 Purchase a kid's bicycle from one of our locations. 3. Trade it in and get up to 50% back for the next size up. *All Bikes must be from the original owner. All bikes must be in safe riding conditions. Trade-Up program is for all Trek branded bikes.